The California Environmental Protection Agency Air Resources Board (ARB) in its latest report suggests that without a significant change in the way Californians move about the state, greenhouse gas emissions will climb and reaching the 2030 GHG target – a level of 40 percent below that which was present in 1990 – won’t happen. The challenge California faces is daunting. And, just how daunting is the challenge for the state? To give you some idea, where driving is concerned, for the past few years, the total mileage tally for California motorists exceeded 330 billion annually. As a matter of fact, all state driving is up including per-capita motoring. So what is California to do? Where does the state go from here? In a sector by sector analysis, we see that transportation is responsible for contributing the largest share of GHGs – 41 percent. This is followed by industrial (23%), electricity – in state (10%), agriculture (8%), residential (7%), electricity – imports (6%), commercial (5%) and not specified (<1%). 2030 isn’t that far off. Golden State population at that time is projected to be somewhere in the neighborhood of 44.2 million people based on the current rate of population growth in state. A challenge, of course, will be how to provide transportation services to the vast majority. It is impossible to tell at this point where exactly transportation will be 12 years from now. Regardless, whatever modes are available then, in meeting the state GHG target, emissions from such will require them to be markedly reduced. What we might see are electric vehicles that can go many more miles than what is possible today. There is simply no telling. That said, range anxiety probably prevents many from going this route. Such could be addressed through advances in battery technology and/or through the incorporation of photovoltaic cells embedded into vehicle body surfaces. Meanwhile, battery recharging needs to be accomplished faster, taking a fraction of the time of that required to accomplish the same today. Then there is the matter of price. If electric vehicle costs to buy, operate, maintain and insure can all be made lower, there is the likelihood of more Californians embracing this mode means and technology becoming greater, provided, of course, people are still owning vehicles. What certainly wouldn’t hurt are rebates and the like, incentives like this perhaps offered in significantly greater numbers than what is now the case. For the record and just so you know if you don’t already, in percentage terms Norway is currently the unequivocal leader with 35 percent of all on-roadway motorcars being electric. California really needs to step up its game in this regard. Then again, maybe subscription services will become the order of the day and consumers won’t be vehicle purchasers. For those traveling from city to city, electric passenger trains might become the mainstay and in this regard the state is off to an excellent start. We’re already witnessing the building of high-speed rail. It is projected that construction will conclude on 119 miles between Shafter in the south San Joaquin Valley and Madera in the Valley’s central section by the close of 2022. With such, this could mean that testing of high-speed electric trains could commence in the Valley soon thereafter. There is also the expectation that Amtrak “California” San Joaquin trains will switch over to the new routing once the line is federally certified for doing such. This means that speeds will be upped significantly from what they are at present – at least between those city-pairs if not beyond, say, for example to Bakersfield on the south end and in the north Valley to Merced. 2022 is also the year that the approximately 180-mile-long XpressWest high-speed train service connecting Las Vegas, Nevada and Victorville, California, is estimated to be completed. 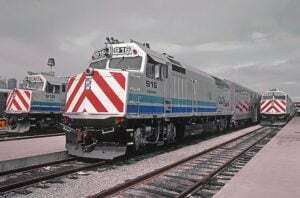 Meanwhile, Caltrain between San Francisco and San Jose has already gotten a jump on the others in that it is currently in the process of electrifying its 47-mile-long operation between those city-pairs with the intent to extend such electrification activity all the way to Gilroy south of San Jose, thus adding approximately another 40 miles. In cities served by high-speed trains, the hope is to have good articulation with many existing passenger rail operations. It is what is referred to as the intermodal aspect. Those heavy rail (BART in the San Francisco Bay Area, the Los Angeles Red Line, et al. ), light rail (L.A.’s Metro Gold Line, San Francisco’s MUNI, and others) and streetcar systems (here again, MUNI in San Francisco) will make much more seamless statewide long-distance travel. These urban and regional services alluded to are electrified already. Other services such as the airport people mover at San Francisco International Airport will help. “Progress at both the Port of Long Beach and the Port of Los Angeles has been ongoing. There have been many air-quality improvement measures implemented such as the Clean Trucks Program; shore- (electrical) power provisions for container ships made available upon docking; the switching of fuel in the container ships to a type far cleaner than what is used in these vessels while in transit on the high seas, once within 24 nautical miles of shore; as well as the use of electrically-powered cranes and other equipment related to the loading and unloading of containers, that is, the equipment utilized during the shipping container transfer process.” It is ditto at other Golden State-based ports, like in Oakland. “What both the UC Berkeley and the Lawrence Berkeley National Laboratory investigating research team found, a team which also included the likes of UC Berkeley civil and environmental engineering professor Rob Harley and the Bay Area Air Quality Management District’s Phil Martien, was: 1) median age of port-serving truck engines, since 2009, dropped from 11 to six years; and 2) the installation of filters to trap particulates in percentage terms jumped from single to almost triple digits – from 2 to 99 percent, in other words, according to the Port. Important are the findings from the standpoint that the trucks make thousands of visits to and from the port yearly. Add to all of this other efforts such as at schools where school buses are required by law to have motors shut off during times when buses wait to pick students up after school. It is more, much more of these kinds of programs that will turn the tide and enable California to meet emissions-reduction goals. That’s what it’s going to take. Though the nagging question is: Does California not only have the drive, but as well the resources – the wherewithal, in other words – to make this happen? For more on this see: ARB’s California’s 2017 Climate Change Scoping Plan: The Strategy for Achieving California’s 2030 Greenhouse Gas Target here. Next time I’ll take a look at programs that address pollution from the state’s stationary sources. That’s coming up on the Air Quality Matters blog. This post was last revised on Dec. 5, 2018 @ 7:57 a.m. Pacific Standard Time. And now we know that the November, 2018 fires in California have about the same GHG output of all of California’s cars driven for one year! Doesn’t that say that we need to do a better job of forrest and brush management and/or if that stuff is going to ultimately burn, shouldn’t it be harvested and burned in a way – season and equipment – that displaces natural gas power generation and minimizes other emissions?